Using trail cameras to capture images of wildlife is becoming an increasingly important management tool. Improving technology is reducing cost, improving reliability, and allowing the deployment of cameras in large numbers in remote locations. Images can provide important information regarding the distribution and abundance of different species, but resulting data rarely meet parametric assumptions and analyses can be challenging. 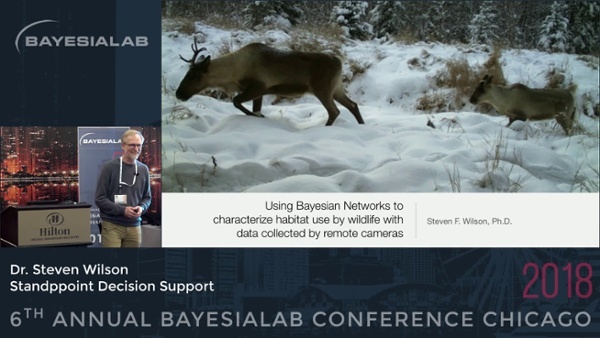 I used Bayesian networks to characterize habitat use by caribou, wolves, moose and black bears in a study area in northern British Columbia, Canada, using data collected at 85 remote cameras. I first used unsupervised learning to generate a network that described the habitat around each camera based on a large number of field-measured variables, and then used clustering to identify latent factors that represented higher-level habitat features. I modelled habitat use by the four species based on these latent factors as well as snow conditions. Results provide insight on the partitioning of available habitat by the different wildlife species and how habitats can be managed to meet conservation goals.